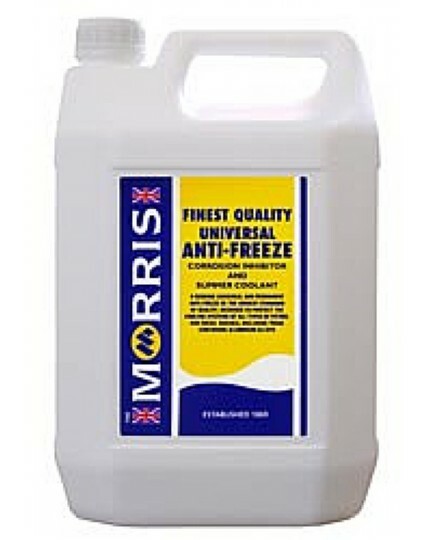 Morris MEG Antifreeze will protect all engines from frost damage right down to –34ºC and ice damage down to –50ºC (at 50% of total coolant volume). It also provides outstanding protection against rust and corrosion for all parts of the cooling system and is therefore recommended for all year round use. This Ethylene Glycol based antifreeze, which meets the technical requirements of BS6580:1992 is designed to meet the demands of modern engines and their cooling systems. Universal Anti-freeze will protect all engines from frost damage right down to –34oC and ice damage down to –50oC (at 50% of total coolant volume). It also provides outstanding protection against rust and corrosion for all parts of the cooling system and is therefore recommended for all year round use. This Ethylene Glycol based antifreeze, which meets the technical requirements of BS6580:1992 is designed to meet the demands of modern engines and their cooling systems.